Bodega Catena Zapata-Malbec-High Mountain Vines-Mendoza-Argentina-2010-13.5% Alcohol-$16.69-A nose of dark fruit and spice, dark garnet in color. A medium to full bodied red, with black cherry, cassis, licorice and chocolate on spiced finish, an easy drinker. WS-89 WE-90 CR-89 Good with meats, chicken, pasta. 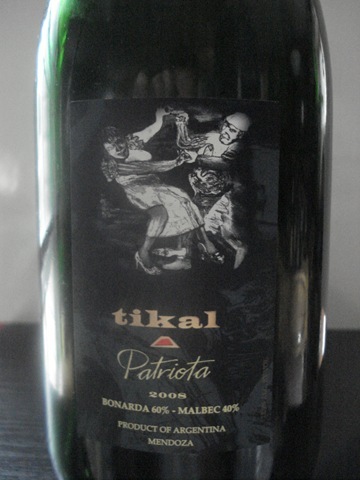 Tikal-Patriota-Bonarda-Malbec-Mendoza-Argentina-2008-$15.98-A nose of dark jammy fruit, dark black in color. A big full bodied blend, not for Old World fans. 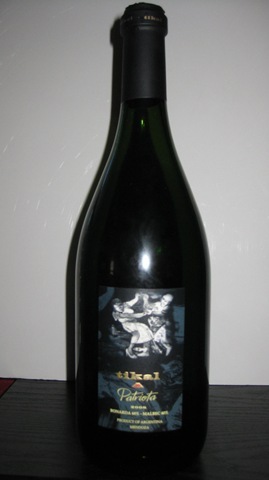 A delicious smooth wine, plum, black cherry, chocolate and spice with toasted oak, a great value. RP-92 WS-88 CR-89 Good with meats, chicken, pasta. Bodega Benegas Winery-Malbec-Libertad Vineyards-Mendoza-Argentina-2007-14.0% Alcohol-$17.48-A nose of dark fruit and spice, dark purple in color. A full bodied Malbec, with black cherry, black currants, licorice and a spice finish, good length, very good QPR. RP-90+ CR-89 Good with ribs, chicken, pasta.